For once, the international break was a welcome distraction, and not just an unnecessary fixture in the calendar. Manchester United supporters enjoyed work, head held high, knowing the team couldn’t let them down – and with a glow of recent victory over Manchester City still fresh. All good things must come to an end though and the Premier League returns with United welcoming Everton to Old Trafford, chasing fourth, and with it a Champions League spot. Louis van Gaal’s team remains in position to challenge for the top four, despite suffering one of the club’s worst seasons during the Premier League era, as well as the most unpredictable. The Dutchman’s team could easily have found itself in Chelsea’s position and not challenging for Europe. The ‘praise’ for reaching this lofty position – if that’s the word – is due not to United but City. The blue side of Manchester has been just as inconsistent as the red this season. Yet, somehow, United has a genuine chance at making the top four, although with Arsenal and City winning on Saturday, Van Gaal’s team must beat Everton this weekend. Winning at the Etihad was United’s first victory in four games. Previously, the team had been knocked out of the Europa League after two shambolic performances against Liverpool, drew at home to the Hammers in the FA Cup, and lost at West Bromwich Albion in the Premier League. Victory over City was predictable though. After all, Van Gaal’s ability to pull off a satisfying win after a run of dismal form has become a speciality. It has certainly been the story of the season – just as United hits rock bottom, and Van Gaal’s position seems unattainable, the team provides an unlikely reason to be cheerful. Impressive, important and fist pumping wins against Everton, Liverpool (twice), Arsenal and City have all come at times where United fans thought it couldn’t get any worse. Yet, these one-off victories also set United’s failures in context – and highlight the bizarre consideration United’s board is giving to employing Van Gaal past the summer should the Dutchman guide his team into the top four or an FA Cup final victory. Although winning the FA Cup would, of course, be welcome, the thought of another season under Van Gaal – and missing out on José Mourinho – is a frightening thought for even the most optimistic United supporter. It’s a possibility though after former manager Sir Alex Ferguson urged the board to give Van Gaal more time. Toffees’ fans are experiencing similar emotions this season after watching a team of frustrating inconsistency. Roberto Martinez, once regarded as the second coming in the blue half of Merseyside, has alienated fans to the extent that few are now supportive of the manager. One of main criticisms is that despite enjoying better players than Moyes ever did, Martinez has failed to take the team further than the Scot could. There is a clear lack of direction from the Spaniard, particularly in defence, which has cost the Toffees all season. It is inconceivable that a team containing talents as rich as Romelu Lukaku, Ross Barkley and John Stones, should languish in 12th. Martinez’ side has lost three of its last four league games, although just once away from home all season. That away form is an obvious strength – and a major threat to United’s hopes. Despite United’s struggles at Goodison in recent times, the Reds hold a good record against the Toffees at Old Trafford, having won 21 of the last 22 games between the sides. Still, Martinez remains confident, claiming his side wants to test itself against “the best.” It’s a wonder that the Spaniard considers United to be one of the best sides in the division, but Van Gaal’s team will have to become one if the Champions League is to become a reality, perhaps winning six of the remaining eight games. Victory over Everton on Sunday is a must after Saturday’s results. United’s injury crisis looks to be at an end, with Van Gaal confirming Ander Herrera and Ashley Young could be in line to make the squad on Sunday. Antonio Valencia has recently returned, Phil Jones is scheduled to play for the under-21s on Monday, and Luke Shaw begins training again next week – 200 days since his injury against PSV. Wayne Rooney is also close to a return, with the captain suggesting that he will be fit for United’s fixture with Tottenham Hotspur next week. Bucking the trend, Bastian Schweinsteiger was injured on international duty and will not play again this season. Van Gaal has no reason to rotate a team that performed well against City, meaning that Matteo Darmian and Marcos Rojo should keep their places at full-back. Darmian was excellent against the blues, keeping Raheem Sterling, and later David Silva quiet. Chris Smalling again partners Daley Blind in the centre, with Smalling returning to form after positive performances for both United and England of late. In midfield, neither Michael Carrick nor Morgan Schneiderlin played for their countries this week, meaning both are fresh for Sunday. Carrick enjoyed one of his better games this season against City and Schneiderlin excelled in a slightly more advanced role. The Frenchman broke up play well, while City’s midfield could not cope when he broke forward – a staple of Schneiderlin’s game at Southampton. The returning Ander Herrera could figure, at least from the bench. Further forward, three attacking positions will be occupied by Jesse Lingard, Juan Mata and Anthony Martial. 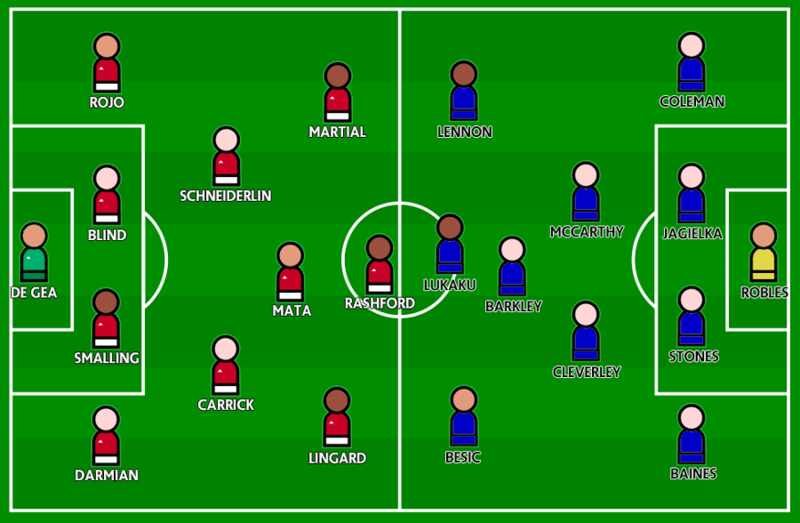 Quite where each will play is anyone’s guess, with Van Gaal switching Lingard and Mata’s roles in recent weeks. Lingard may play wide after a good performance at 10 against City to attack an ageing Leighton Baines. Anthony Martial continues on the left after shining for France in midweek. Up front, Marcus Rashford became the youngest ever scorer in the Manchester derby. Rashford now has five goals in seven appearances for United and looks set to keep Memphis out of the starting line-up. Rashford’s pace and unpredictability is his major asset – he’ll fancy his chances against Phil Jagielka, as he did against Martin Demichelis last week. I’m depressed I cling to hope, hearing LVG might be here next season makes me wish we lose to get him sacked. United have been so erratic, even with the ‘strongest’ squad. I just think we are playing too timidly to challenge top four. We could easily have been caught out by Everton, and by so many others this season. City at least with De Bruyne back look like they mean business. Reckon we will finish fifth.. Sadly.